25603.diff​ (8.3 KB) - added by jorbin 6 years ago. 25603.2.diff​ (8.3 KB) - added by jorbin 6 years ago. 25603.3.diff​ (8.6 KB) - added by jorbin 6 years ago. 25603.4.diff​ (11.0 KB) - added by nacin 6 years ago. 25603.5.diff​ (3.9 KB) - added by jorbin 6 years ago. 25603.6.diff​ (8.5 KB) - added by melchoyce 6 years ago. about-images.zip​ (46.3 KB) - added by melchoyce 6 years ago. 25603.7.diff​ (12.6 KB) - added by melchoyce 6 years ago. 25603.8.diff​ (10.8 KB) - added by jorbin 6 years ago. 25603.9.diff​ (10.7 KB) - added by jorbin 6 years ago. 25603.patch​ (8.5 KB) - added by ocean90 6 years ago. 25603.2.patch​ (10.3 KB) - added by ocean90 6 years ago. 25603.10.diff​ (2.0 KB) - added by jorbin 6 years ago. 25603.11.diff​ (1.5 KB) - added by jorbin 6 years ago. 25603.12.diff​ (394 bytes) - added by jorbin 6 years ago. 25603.13.diff​ (400 bytes) - added by jorbin 6 years ago. 25603.14.diff​ (434 bytes) - added by jorbin 6 years ago. 25603.15.diff​ (494 bytes) - added by jorbin 6 years ago. 25603.16.diff​ (2.4 KB) - added by jorbin 6 years ago. 25603.17.diff​ (2.4 KB) - added by jorbin 6 years ago. 25603.18.diff​ (1.9 KB) - added by jorbin 6 years ago. 25603.19.diff​ (3.3 KB) - added by nacin 6 years ago. 25603.20.diff​ (4.1 KB) - added by nacin 6 years ago. 25603.21.diff​ (5.2 KB) - added by nacin 6 years ago. 25603.22.diff​ (5.9 KB) - added by nacin 6 years ago. 25603.23.diff​ (5.9 KB) - added by nacin 6 years ago. 25603.24.diff​ (4.5 KB) - added by azaozz 6 years ago. 25603.25.diff​ (314 bytes) - added by azaozz 6 years ago. markjaquith and I took jorbin's text and turned it into this (see 25603.4.diff​ for the very rough cut). The images were a cut-and-paste job from some sample about page designs that melchoyce did. Yes, that is an actual working password meter. markjaquith and I have plans to fill it with default values (add a character every second and watch as it cycles through each level, before clearing it again - until the user focuses on the field to try it themselves). Please critique the text in particular. The UI needs work; suggestions are also welcome. But finalizing the text is key in order to hit RC1. The screenshot didn't cut off remaining Under the Hood items — there are only three. The others just aren't very compelling. (Even the multisite one isn't very compelling.) Let's keep it simple. Update the text for the about page, so translators can get started. Design is in flux. props nacin, markjaquith, jorbin, jenmylo. With , the lid is closed on the text (barring any typos). jorbin is working on the password meter and he and melchoyce I think are trying to improve the page visually. I'm okay with doing this right after RC1 — important part is the strings for translators. My new patch adds some animation and a working password strength meter. This latest patch adds images into the page to help illustrate the major sections. I ran into some issues trying to size the images. No matter what size image I use, the page resizes it to 100px x whatever is proportionate. I have no idea how to fix it to use the native image size. Right now, I'm using the 2x-sized images for better quality. Just kidding. Image sizes should be fixed in 25603.7.diff​. refreshed my patch to include mel's patch. Also fixed a race condition and renamed the file so it is more generic and we can then reuse the new about.js in the future when it might not be an animation. latest patch removes all include styles and an unneeded ternary. It will need some small fixes for older IEs (it's using nth-child right now), but should be good to get all the strings finalized. 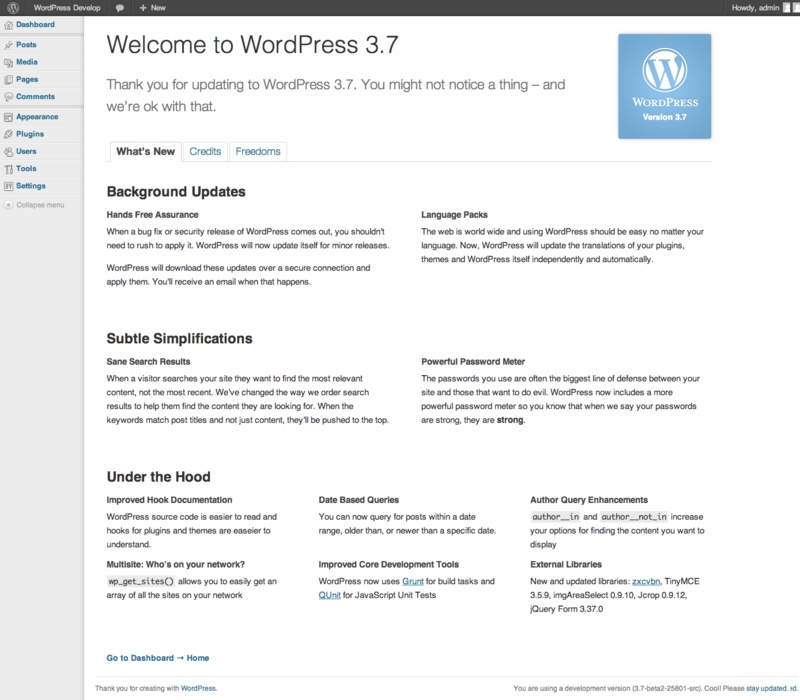 Awesome about page design for WordPress 3.7. The page includes a giant password meter that serves as both an animated example and a working demo. How cool is that? Remove rarr from about page text. Use a subtle background instead. mark and I are not color experts — I defer to melchoyce if she wants to change the colors we used in . I just wanted to make sure the arrow was dropped from the strings, so translators could get to work. Better alignment of the input and password meter. Stupid content-box. When the animation resets, it stays on "Strong" for a time. This odd flicker happens with a normal meter too, but it's more glaring when it is an animation (at 200% size no less). Would be nice to fix. Should the animated password "Gosh, WordPress is grand." be offered for translation and passed into the script via wp_localize_script? I had the same thought, but the string isn't actually visible in the password meter. Ha, true, it's a password field after all :-) Nice one! I can't see the images on a multisite install. That's right. I think they are just placeholder and will be loaded from wordpress.org later. We did this for screenshots in 3.6 to keep the package size down. But this about page is very simplistic, and the images are only a few kilobytes each. So I committed them in . I'll change these to use full paths. 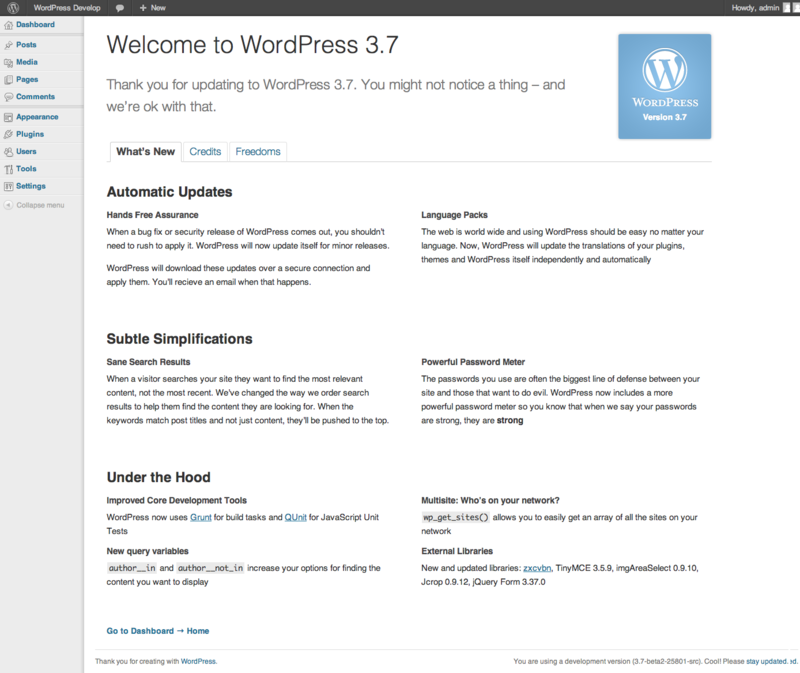 Use full paths to images so they work on wp-admin/network/about.php and user/about.php. see #25603. CSS cleanup for the about page. Also fixes for IE and support for RTL. About page: Use box-sizing: border-box on the password meter so pixels line up. Also eliminates a duplicate width: 100% property. IE7: Fix width of the password input field on the about page. see #25603. Since we're dealing with a huge password meter, don't bold half of the result strings unnecessarily. see #25603. About page: Prevent the meter from briefly sticking on 'Strong' when the animation resets. Vendor-prefixes for . props jorbin. see #25603. Also reported in IRC: ​https://irclogs.wordpress.org/chanlog.php?channel=wordpress-dev&day=2013-10-18&sort=asc#m709151. Will be fixed in MP6. Deactivate WordPress Beta Tester plugin, delete the transient wordpress_credits_$locale or wait 24 h for expiration, then revisit credits.php. It seems this plugin manipulates the version parameter of every (!) request to the WordPress.org API. This side effect is reported to the plugin authors. 25603.16.diff adjusts the speed to be a bit faster and have a bit less variance. Also, I took a look at the performance and each lookup to zxcvbn was taking the most amount of time, so I added a simple cache so that we don't hit zxcvbn after the first time through. It exposes the email address to everyone. Authors can see the admin_email, and in multisite, anyone can see the network admin email. (This email address is supposedly used for communication with users, but that's not really the case.) Suppressing the email is therefore necessary. If auto updates are 100% disabled, we'll claim that we'll email users of pending updates — but that's not true, as the update notification is currently baked directly into the automatic updater class. I snuck in a comment yesterday in , you can see it at the top: "This [100% disabling] also disables update notification emails. That may change in the future." current_user_can( 'update_core' ) is required to view the site's status. If the automatic updater is 100% disabled, we don't show anything either. This only happens for DISALLOW_FILE_MODS (for which current_user_can( 'update_core' ) fails anyway), AUTOMATIC_UPDATER_DISABLED, and the automatic_updater_disabled filter. Note that this constant and filter is the updater, not particular updates. To only disable core updates, you will want to use the auto_update_core filter, the WP_AUTO_UPDATE_CORE constant, or the various allow_*_auto_core_updates filters (where * is 'dev', 'minor', and 'major'). It assumes that if the user can update_core, they can see the admin email. Adds the notify_core_update filter because the filter auto_core_update_send_email also blocks critical failure and update success emails. We don't want people using that filter to block *notification* emails, because they might accidentally block fail/success emails as well. That _send_email filter isn't even run for 'manual' (update notification) emails anymore. Just to be clear, 100% disabling the updater with AUTOMATIC_UPDATER_DISABLED (or the like) doesn't just prevent core updates, it also prevents plugin, theme, and translation updates. Translation updates are on by default; the other two can be turned on with a filter. Seems good. New filter name is more clear. In 25603.24.diff: cleaned up 25603.17.diff and replaced _.shuffle() with Math.floor( Math.random() * timesForAnimation.length ) as suggested by @nacin. Introduce a send_core_update_notification_email filter to control whether to send update notifications. Currently, this is dependent on whether the automatic updater is enabled (generally). This is likely to be decoupled in a future release. This refocuses the auto_core_update_send_email filter to specifically be for success/fail emails for auto updates, while the new filter is more general. About page, updates section: Don't show a message on about.php if the updater is 100% disabled. Don't show it if the user can't update core. Don't show the email if notifications are disabled. New string. About page: Cache our zxcvbn calls and limit the variation of the animation. Merges  to the 3.7 branch. 25603.25.diff adds a long-missing </div> to fix html validation.